Like the Lebombo Euphorbia tree after which it was named, the design of Lebombo Lodge is one of a kind. From the sweeping wooden decks, you can watch the theatre that unfolds before you, while the lap pool beckons to enjoy a relaxing afternoon. 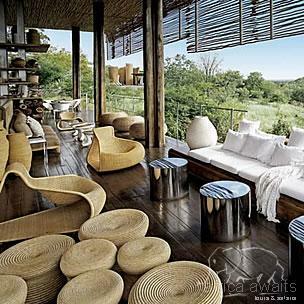 Singita Lebombo Lodge can accommodate 30 guests in 15 suites. All suites are en-suite with an inside and outside shower, bath, mini bar and fridge, room safe, air-conditioning, overhead fans, direct dial telephones and game viewing deck with a day bed. All the suites have direct dial telephones. The main lodge boasts an open-plan lounge and bar area complete with a library and internet and computer facilities. Dining areas overlook the expanse of the Lebombo Concession. There is also a gymnasium, health spa, wine cellar, traditional boma and a swimming pool on the property. 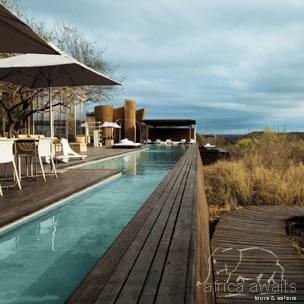 Singita Lebombo Lodge rates include twice daily game drives with professional guides and trackers. Guided safari walks on request. Mountain biking and archery. All-suite accommodation, three meals per day, all drinks, including premium wines, spirits and liqueurs (excluding champagnes). Laundry & valet services . Other services available at Lebombo Lodge include Shopping in the the Singita Shop which stocks a range of African artifacts and curios. A spa complete with a fully-equipped gymnasium. A swimming pool at the main lodge. Internet, satellite TV and fax facilities. 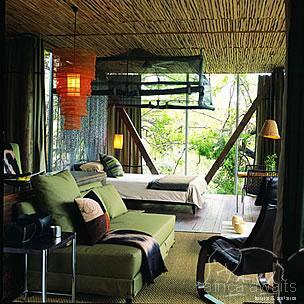 With your holiday, safari or business trip from in to Singita Lebombo in Kruger National Park.